Seriously, anchoring yourself in your well-being every day — many times a day if needed — has a direct and profound affect on your child’s well-being. And as time allows, you can also practice Reiki on child (make sure you learn how in your Reiki training). That’s such an important and overlooked point that it bears restating. Reiki professionals cannot appreciate how profoundly this gentle practice can support your child’s system in finding its own unique balance unless they have a strong foundation of daily self Reiki. Without that foundation, they are more likely to be intrusive and even judgmental. Keep in mind that unlike other spiritual healthcare professionals, Reiki practitioners rarely have training in ethics and clinical arts. Already practicing Reiki? The Reiki & Medicine Intensive will help you understand why your practice is so effective and how well it integrates with conventional medicine. Great Article, My children have grown up with Reiki an my grandchildren receive Reiki as soon as there born. I have always worked on children, teenagers and have had amazing results. Hospitals are starting to open up. I live close to Ithaca N.Y. which is a very open community to holistic health. Someday we will be teaching in schools and assisting the students. While assisting in a Reiki share we had parents and a grandmother bring a 1 year old in. The instructor was scared and turned to me. Gentle Reiki was performed and the baby and parents were very relaxed and what needed to come to the situation was balance for the parents and grandmother. Thank you for sharing your anecdote, Sharon. I am a little confused about one thing — isn’t all Reiki practice gentle? I have been trained in Reiki for 17 years (even took level 1 twice) but didnt start using it daily until the spring of 2018. I was suffering with autoimmune stuff and started to do self Reiki at night for my headaches. I had such profound results that it sent me on a mission to refresh all I knew about it. I then started doing Reiki on my kids at bedtime. I tell you, bedtime has never been so peaceful and expedient! Whenever they get hurt or arent feeling good they ask for Rieki. I cannot express what a beautiful thing it has been for us!! I am in doing level 2 part 2 in a few days! What a wonderful article, thank you! I love how you highlight the fact that Reiki training isn’t standardized, and to be honest it scares me to think that someone might print their own certificate ??? No matter the age of the students, it’s always important to teach to the people in the room. There are so many different approaches to Reiki practice that I cannot go into detail, but that will give you a good foundation. If you want more, consider the How to Teach First Degree Reiki recorded training in my Reiki Professional Academy. It gives a structure that you can adapt to any practice style and any age group. It would be wonderful for more children to have Reiki as a means to provide self-care anytime. Too many children are given prescriptions for ADHD or anxiety. Reiki could certainly help. I wished I had learned Reiki in my teens/early 20’s. What a positive difference it would have made earlier in life as a healthy way to reduce stress and promote balance. At the beginning of the school year, I got a 7 year old client who was having ‘behavioral issues’ in school. They were potentially going to be moved into a ‘special ed’ class as the meltdowns were causing much distraction at school. They were considered to have ADHD (accent on considered… this labeling has gotten way out of hand and is not being properly screened across the board). The parents, not knowing what to do to alter the situation for their very bright child, sought an alternative treatment. They did not want this stigmatizing label put on their child nor use the recommended medications. They were at their wits end finding discipline techniques, as they were told by teachers to do, with which they were comfortable and able to apply consistently. This young client not only got a handle on themselves exhibiting a greater level of ‘self control’, their tantrums became more like ‘huffs & puffs’ and even that now rare. ADHD is off the table so of course so are the meds. The parents are of course so very grateful and I now treat the teacher’s child! Friends are starting to call me the ‘baby whisperer’! LOL Oh… and the mom just got her Level 1 training yesterday. Teenagers, right? So I sat him down on the couch where he could watch football, and I gave reiki just to the injured knee for 10 minutes. When we were finished, he wanders away and sits at his computer and I hear from the other room “huh – it doesn’t even hurt anymore” later on he asks me “What even IS reiki? !” So we talked about it and he asked for Reiki everyday after that until he was better, which along with Physical Therapy took about 2 weeks. Now I tell that story to skeptical patients and I ususally convinced them to try it. What a wonderful story, Claudine! Thank you so much for sharing it. My kids and I sometimes practice Reiki while watching baseball games, both full treatments and to calm ourselves when our team isn’t doing well. I am a Reiki practitioner at the Children’s Hospital in the UK and our project has been running for 6 years. 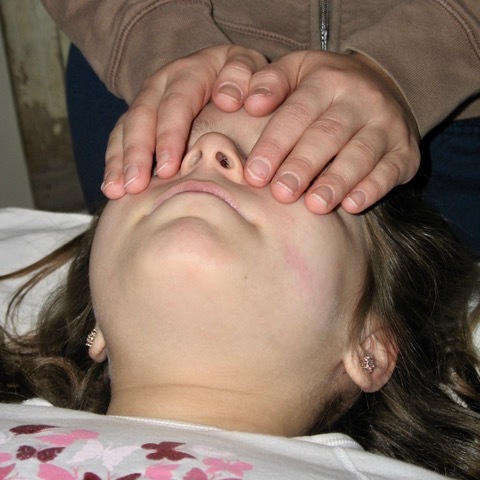 I would like to share an experience from my private Reiki for Kids practice. A delightful 3 year old girl comes in for a treatment with mum and decides that we must include her special soft toys in our treatment. This is a great way in when you are having difficulty in approaching a child, or they are very shy or nervous about you and the strange thing your hands are doing… so Reiki can start through a soft toy, a favourite teddy. So we started our session by giving Reiki to her 3 favourite soft toys, a blue, a brown and a white rabbit, an entire rabbit family! Soon enough she stopped moving around, laid down and became very calm. I carried on and moved my hands towards her body, I usually work hands off the body, so just above it. Afterwards she just sat down, rearranging her rabbits’ positioning and held her hands over them.